Mindahi Crescencio Bastida Muñoz is the director of the Original Caretakers Initiative at the Center for Earth Ethics. He serves as the General Coordinator of the Otomi-Hñahñu Regional Council in Mexico, a caretaker of the philosophy and traditions of the Otomi people, and has been an Otomi Ritual Ceremony Officer since 1988. Born in Tultepec, Mexico, he holds a doctorate of rural development from the Universidad Autónoma Metropolitana and is the President of the Mexico Council of Sustainable Development. 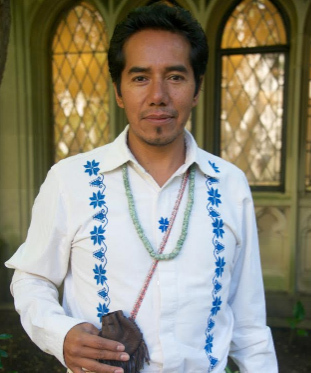 Bastida Muñoz is a member of the steering committee of the Indigenous Peoples’ Biocultural Climate Change Assessment Initiative, and has served as a delegate to several commissions and summits on indigenous rights and the environment. He has written extensively on the relationship between the State and Indigenous Peoples, intercultural education, collective intellectual property rights and associated traditional knowledge, among other topics. My name is Mindahi Bastida from the Otomi-Toltec-Mexican original peoples. I have been working with indigenous peoples and communities mostly from the Americas and other parts of the world such as Australia, Japan, Africa and the Arctic. For 500 years indigenous peoples have been facing the dispossession of our lands from mining and deforestation, concentration of land, invasions to our territories and so on. Our work is directed towards the protection of our Mother Earth as Original Caretakers and also through the Unification Process among Indigenous peoples and other allies. Why is it important to protect and preserve sacred sites? The Biocultural Sacred Sites are the source for sustaining life systems on the planet; they are critical nodes for maintaining Biocultural and intercultural cohesion. They are essential for the good living as they provide the spiritual energy which sustains the flourishing of life. They are vital for the survival of humans and all beings. How does the Center assist you in your work? The Center is key in supporting the protection and preservation of Sacred Sites and the ongoing Unification Process among Indigenous Peoples and other actors. The Center has been organizing and participating in events where indigenous spiritual leaders presence is important. Their wisdom, based on the traditional philosophies and cosmologies of Native peoples, is vital for the life in this world. CEE always finds the ways for us, as original caretakers to be involved or participating at the local and international level where we can participate and share our work with other organizations, communities and institutions. What can other faith communities do to support Indigenous peoples? Most Indigenous Peoples have their own spiritual practices. Some are mixed with other faith traditions. Other faith communities are beginning to support Indigenous peoples’ spirituality and struggles by respecting and honoring our spiritual traditions. However, some faith communities still threaten our spiritual practices and they push for conversion. These practices have affected not just the spiritual lives of peoples’ cultures but the life systems. We need other faith communities to acknowledge the spiritual practices of indigenous peoples and understand the intrinsic value of these practices for life on Mother Earth. Whenever there are meetings or events that affect indigenous peoples spiritual beliefs and lives they should be present at all times, especially to ensure that their rights to prior informed consent is met for any development project.